Today, Drum Corps International kicked off its annual winter meetings and workshops in Atlanta, Ga., themed "The Power of One." DCI.org's Michael Boo sat down with several attendees and interviewed them about their expectations for the conference. Gary Doherty is a band director at Midland High School in Texas. His "Thunder in the Desert" event is a Drum Corps International sanctioned show that is entering its seventh year. This is my seventh time to be at the January meetings. We brought in three people from our show committee to learn at this year's workshops. We love networking with people who run other shows, and I've made great friends through the TEP workshops. Not only do we learn who the various Drum Corps International people are, but if I have a problem down the line, I can call the other Tour Event Partners that I have met here and ask them for advice. The networking is as important as the workshops. "The Power of One" addresses how people can be motivated to look for ways to make themselves better so that the shows get better. They are focusing on their own contribution to their event. We're building a team, just like a drum corps, each having to work in harmony and pull together for the sake of the event. Ron Crenshaw has been director of Spokane Thunder, a Division III corps from eastern Washington, for less than a year. The corps placed sixth in Division III at the 2006 DCI World Championships. The networking opportunities and getting to know the other directors and how they operate is something I'll take from these meetings. When we're looking at the concept of "The Power of One," the smallest Division III corps has to be as viable to Drum Corps International as the best Division I corps is. Being here and participating in these sessions allows us to gather the information, knowledge and importance of the activity and then take it back to our corps and bring our collective powers into the grand scheme. When I talk to my members about our drum corps, I stress the "power of one" through their individual efforts to create the strength of the group. Here at the seminar, we are redirecting this power and magnifying the power of one single individual by everyone in the organization. Attending these sessions makes us feel less isolated, and we gain the power of other individuals who are here. We can go home and spread the empowerment of our influence as individuals. Jason Carter is the staff coordinator and brass caption head of Citations, a Division III corps from Massachusetts. This is his first DCI workshop. I'm here to learn and be exposed to new ideas, to learn what others are doing, and to assimilate that knowledge to help my corps be as competitive, current and entertaining as we can be. Being that this is my first seminar, I'm interested in seeing how ideas are exchanged. For example, there's a session on looking at the judging sheets and how the judges and instructors can all get on the same page, so the corps know what the judges are looking for and the judges know what we're trying to accomplish. 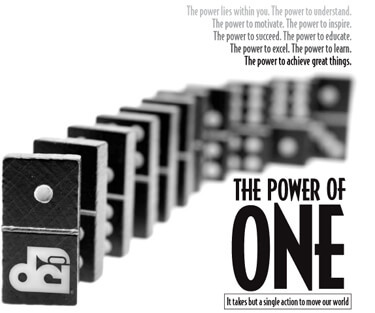 To me, "The Power of One" means that individuals have to do their personal best to reach their benchmarks and achieve their own milestones. The individuals striving to be better every day makes the corps better. Each individual has the power to help the next individual. The power of that person to make others better is infectious.